After the big unveils earlier in the week during Nintendo's E3 press conference, retailer GameStop now apparently has listings for a range of Wii U content. Awesomely, they're tucked away not under "Wii U", but under "Sega Saturn". So if you want to be a smartass tomorrow, go into GameStop and ask to preorder a Saturn game. While there are no prices or release dates (those listed are placeholders), the list of games there should give you a good idea on which titles shown off this week will be turning up at or near launch and which won't. The fact Aliens' placeholder is a year later than everything else's is...interesting. 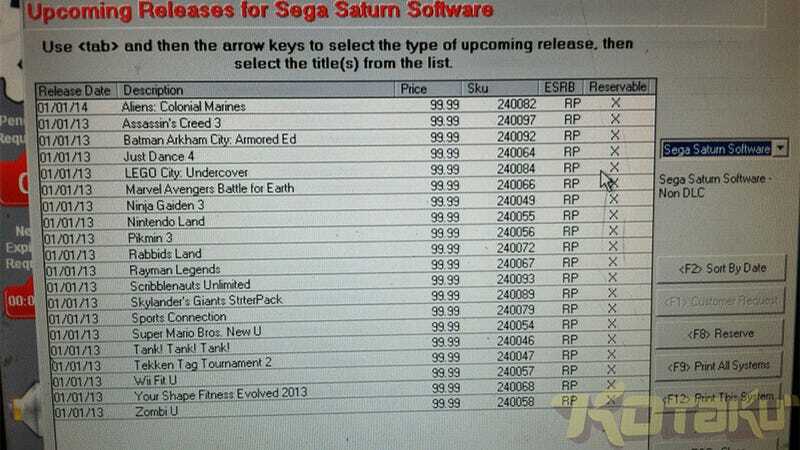 Remember this is unconfirmed (we're checking with GameStop), so take it all with your usual preference of salt.